Good morning, everyone. To those of you who are celebrating Father’s Day today, I hope you have a lovely time. My weekend has been evenly split between work for my MNT class and celebrating the upcoming arrival of my best friend’s first baby (her shower was yesterday!). Between the shower and Father’s Day today, I’ve been thinking a lot about being a child and being a parent, about the role of family in our lives. This past year presented me with some family difficulties, so it feels like a tender topic on this particular Sunday. But to watch Chloe prepare for the arrival of her newborn gives me a lot of joy, because I know she’ll be a great mom. I can’t wait to meet her little one. 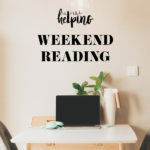 And in other news, here are the foodie links and reads that I’ve been checking out this past week. I’m not a huge pizza lover, and this is mostly due to the fact that I’ve never had much talent for making good crust. 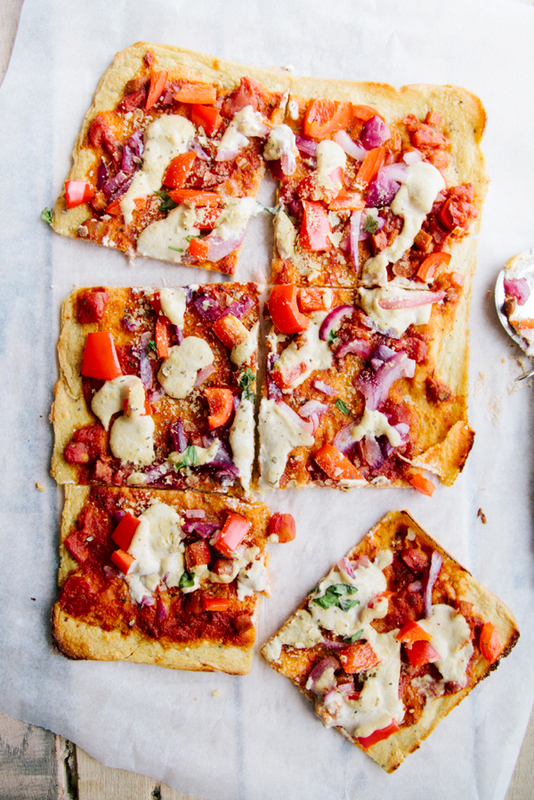 I do love non-traditional crusts, though–tortilla pizza, polenta tart/pizza, that kind of thing, provided they’re easy and low stress–and Aimee’s socca pizza with cashew cheese sauce is totally calling my name. Sometimes it really is the simplest things that are the most enticing. 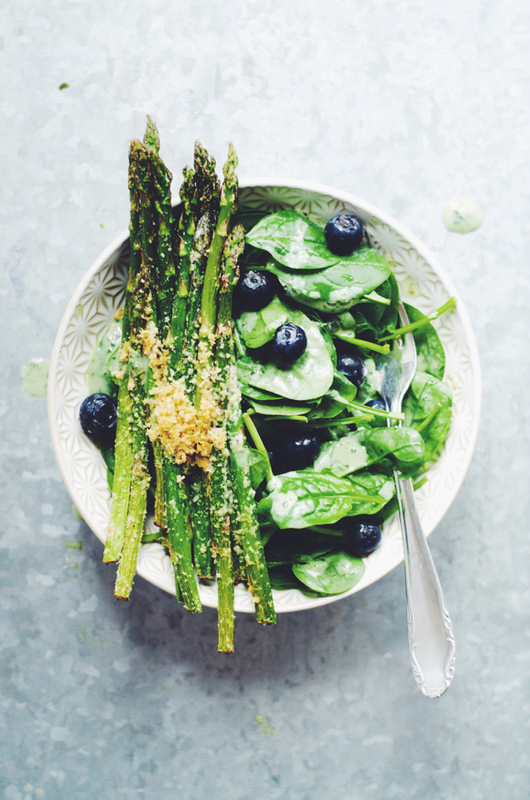 Like this recipe for cheesy vegan asparagus, which is really just asparagus roasted with olive oil, salt, pepper, and nutritional yeast. If I were to make this, I could probably polish off the entire tray’s worth of asparagus without any help from Steven–but he loves asparagus as much as I do, so I wager I’ll double the recipe when I try it. Speaking of nutritional yeast and other favorite things, I love this recipe for kale and cabbage salad. 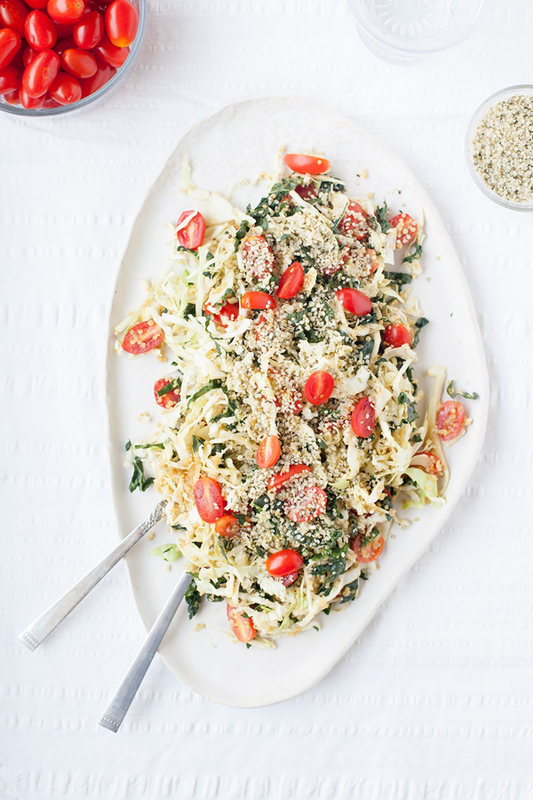 It’s a mixture of cabbage, dino kale, and cherry tomatoes, topped with hemp hearts and a nutritional yeast vinaigrette. Super nutritious, refreshing, and a creative way to add protein to a simple slaw. Can’t wait to try it. 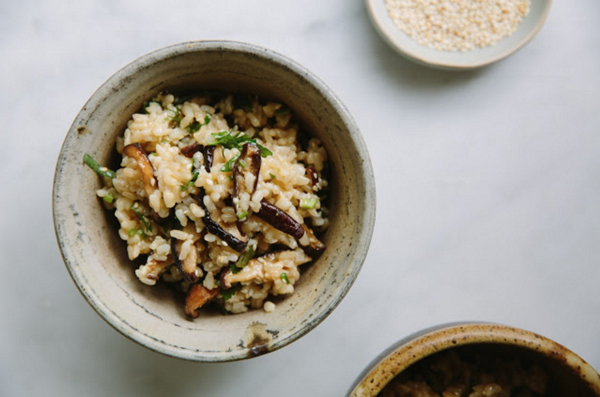 I’m swooning over all of the goodness in Emma’s roasted shiitake brown rice salad. Aside from the fact that I could eat brown rice with every meal, I’m loving the combination of earthy roasted shiitake mushrooms and fresh spring chives, plus the miso dressing. Dishes like this prove that it’s possible to build so much depth of flavor and umami without any animal protein. 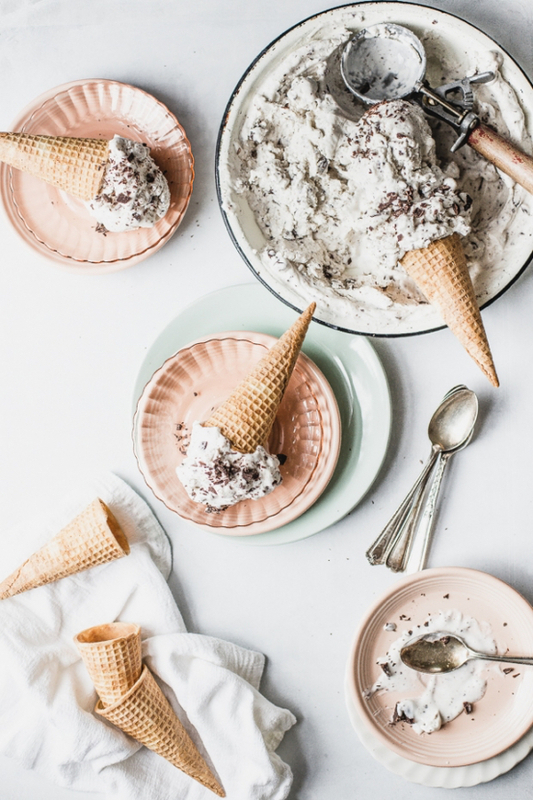 Finally, I’m all over this summery recipe for vegan mint chip nice cream, courtesy of Holly at The Modern Proper. Cashews, coconut, dark chocolate–basically, all of the delicious vegan desserty things. And there’s no ice cream maker required–it just solidifies in the freezer. Yum. To begin, I want to share a blog post that my friend Maria wrote. Like all of Maria’s posts, it weaves together food, personal reflection, and experience in surprising ways. The post is wrapped around Maria’s experience picking up AA Milne’s The House at Pooh Corner (you can see one of the original Ernest Shepherd illustrations from the book above) years after reading it for the first time. Maybe it’s my mood these days–a little sad, a little uncertain, and more than a little confused about my own future–that makes these lines resonate as deeply as they do. But we all, I think, wish sometimes that we could freeze a part of life that is by its very nature destined to change. Maria’s post speaks to that, and more. 2. In health news, a new study from the Harvard T.H. Chan School of Public Health links consuming a plant-based diet to a substantially lower risk of developing type 2 diabetes. The study feels relevant because we’re currently studying Type I and Type II diabetes and care in my medical nutrition therapy course, and we’re encountering all of the many challenges that come up for dietitians as they try to administer dietary advice. As a future practitioner, it’s so great to know that there’s a dietary pattern out there that offers real hope to those who are struggling with this difficult illness–and it happens to be a dietary pattern that I’m passionate about and eager to share through food and recipe ideas. Of course, there are other proven approaches to managing Type II DM, but the more options available to patients, the better. 3. Another new study, published in The BMJ, is linking consumption of whole grains to substantial reductions in the risks for coronary heart disease, cancer, stroke, and all-cause mortality. Specifically, the British researchers found that when subjects consumed 90 grams of whole grains per day, or about 3 servings, the relative risk of coronary heart disease dropped 19%, the risk of overall cardiovascular disease dropped 22%, mortality from stroke 14%, cancer 15%, and all cause mortality by 17%. They also found that the relationship between whole grain consumption and disease likelihood reduction was linear, which is to say that the more whole grains people eat, the more disease risk falls. Whole grains may well be my favorite foods, and while their health benefits have been demonstrated in a body of evidence that spans well beyond this single study, I love learning more about their dietary value. If nothing else, it’s motivation for me to keep crafting tasty whole grain recipes for my clients! Here’s a link to the BMJ study. 4. Sad news: scientists are saying that the Bramble Cay melomys, an Australian rodent, is the first documented mammal species to have made extinct by human-caused climate change. The rodent was known to have lived on Bramble Cay, an atoll in the Torres Strait, and rising sea levels were the cause of extinction. So sad, and likely not the last instance of mammalian extinction we’ll hear about in the coming years. 5. Finally, my editor at Food52 sent me a link to this fascinating article about ED recovery during Ramadan, which is currently underway. The article touches on so many important topics: the association between spirituality and fasting, which is common to many faiths; the lack of support, understanding, and specialist treatment for EDs in many south Asian Muslim communities; and, in a very broad way, the complexities that can arise when recovery seems to conflict with tradition or family life. She adds: “I know in my head that I need to stick to the diet and do what my doctor says. But it’s still uncomfortable preparing food while my family aren’t allowed to eat or drink.” At times she “feels guilty while she’s eating”, she says, and there are moments when she’s tempted to go back to fasting again. It’s an important article for anyone who feels that faith or culture have intersected with the recovery process, and I’m glad that Sofia had the courage to share her story. I hope you all enjoy the end of this weekend. I’ll be back this week with a new slow cooker recipe (hooray! all the leftovers!) and a summery salad that I’m super excited about. I always enjoy going through your weekend links. Looking forward to checking out the research studies you mentioned. I also have some nutritional yeast to use up before I move next weekend, so those recipes were perfect!